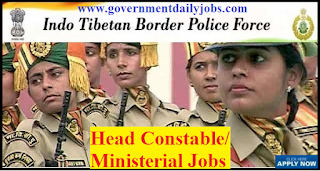 NOTIFICATION: Indo Tibetan Border Police Force (ITBPF) Delhi (Government of India, MHA) inviting online applications for filling up 62 vacant posts of Head Constable (Combatant Ministerial) Male & Female from eligible and interested willing candidates. It is latest & good information for unemployed personnel those who are looking for these new Jobs in Government sector & other organizations. Job seekers, who wish to apply for these vacancies regarding ITBP Recruitment 2017, must have passed Intermediate or Senior Secondary School Certificate (10+2) examination from a recognized Board or University or equivalent and Typing speed of 35 wpm in English or 30 wpm in Hindi only on computer with a required experience if asked. Applicant’s upper age should be as per Govt. rules and age relaxation is applicable to all reserved category candidates i.e.SC/ST/OBC/Ex Servicemen/Women candidates etc. NO OF POSTS: 62 vacant posts of Head Constable (Combatant Ministerial) Male & Female in Indo Tibetian Border Police Force (ITBP), Delhi. 1. Head Constable/ Combatant Ministerial (Direct Entry): 45 posts. • UR Category: 25 Posts. • OBC Category: 10 Posts. • SC Category: 08 Posts. • ST Category: 02 Posts. 2. Head Constable/ Combatant Ministerial (Female) 15% of DR: 08 posts. • Unreserved Category: 05 Posts. • OBC Category: 02 Posts. • SC Category: 01 Post. 3. 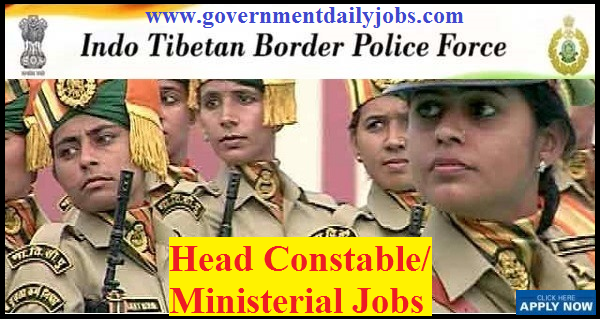 Head Constable/ Combatant Ministerial (LDCE) (ITBP Departmental Candidates Only): 09 posts. • UR Category: 07 Posts. • ST Category: 01 Post. EDUCATIONAL QUALIFICATION: A passed of Intermediate or Senior Secondary School Certificate (10+2) examination from a recognized Board or University or equivalent and Typing speed of 35 wpm in English or 30 wpm in Hindi only on computer. PAY SCALE: Level 4 in Pay Matrix Rs. 25500-81100/- (as per 7th CPC) for ITBP Head Constable Recruitment 2017-18 Apply Online Group C 62 Posts. Allowances: The post will carry Dearness Allowance, Ration Money, Kit Maintenance Allowance as admissible from time to time, Special Compensatory Allowance while posted in specified border areas, free uniform, free accommodation or HRA, Transport Allowance, Free leave pass and any other allowance as admissible in the Force from time to time under the rules/instructions. 18 to 25 years as on 01-08-2017. AGE RELAXATION: As per Govt. rules age relaxation is applicable for said post to all reserved category candidates for ITBP Recruitment 2017 Apply Online for 62 Head Constable Posts. REQUIRED APPLICATION FEE: For said vacancy a non- refundable application fee is to be paid by the candidates as per rules. An amount of Rs.100/- by General & OBC category candidates to be paid in through online mode. SC/ ST, Ex- Serviceman and Female candidates are exempted from application fee. भारतीय सेना विभिन्न प्रकार के सैनिकों की भर्ती रैल्ली द्वारा, सम्पूर्ण देश में विभिन्न राज्यों तथा अलग -अलग तिथियों में करने जा रही है देश प्रेमी, बीर नौजवान इस रैली भर्ती में भागीदारी कर सकते हैं, सम्पूर्ण जानकारी हेतु यहाँ संपर्क/लोग इन करें। रैली से पहले ऑनलाइन रजिस्ट्रेशन करना जरुरी है जो यहाँ पर किया जा सकता है - Various vacant posts of Soldier General Duty (Sol GD), Soldier Technical (Sol Tech), Soldier Clerk/Store Keeper (Sol Clk/SKT), Sol NA/ NA (Vet) and Soldier Tradesmen (Sol Tdn) through Rally Recruitment in Indian Army. Attend Rallly Recruitment on the date, time and Venue /Place given in concerned ARO notification along with required copies of documents, original documents and 20 passport size photos for Army Rally Recruitment Soldiers in all States of Country. SELECTION PROCESS: Applicants who are screened for applicability /eligibility are being selected as per organization policy/rules depending on the basis of their performance in Physical Standard Test, Written Test & Medical Examination. • First Phase: Height Bar, Physical Efficiency Test, Physical Standard Test, Biometric Identification. • Second Phase: Written Examination, Skill Test. • Third Phase: Documentation, Medical Examination. HOW TO APPLY: For said posts (ITBP Recruitment 2017 latest 62 Head Constable Vacancies, Apply Online) eligible, willing and interested candidates may apply through online mode at official website up to 13-11-2017. Applicants must retain with them a hard copy for future reference. 6. Fill in all the details & submit the form. CONTACT ADDRESS: ITB Police Force, Block No-2, CGO Complex, Lodi Road, New Delhi, Delhi 110003/Phone: 011 2436 2837. CONCLUSION: ITBP Delhi invites online application for the recruitment of 62 vacant posts of Head Constable (Combatant Ministerial) on regular basis from Indian residents who are eligible & interested; candidates can apply through online application. ITBP Recruitment 2017: The Indo Tibetan Border Police (ITBP) has released a recruitment notification for candidates willing to join as ITBP Head Constable (Ministerial). Candidates can apply online for 62 Head constable posts at recruitment.itbpolice.nic.in. The last date to apply is November 13, 2017. LAST DATE TO APPLY: 13-11-2017 for ITBP Recruitment 2017-18 Notification Head Constable 62 vacancy.